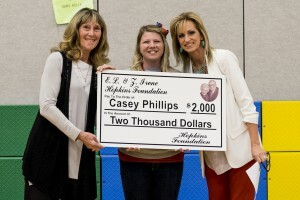 Casey Phillips, a student support specialist at Timmerman Elementary, received a $2,000 Hopkins Award today during a surprise school assembly. She is one of six Hopkins Award recipients so far this school year. The presentation was made by Michelle Hopkins-Molinaro, vice president and managing director of the E.L. & Z. Irene Hopkins Foundation, and Carol Hopkins, foundation board member. In addition to the $2,000 cash award, Phillips will receive another $1,000 to spend on something to benefit a specific school or district program. 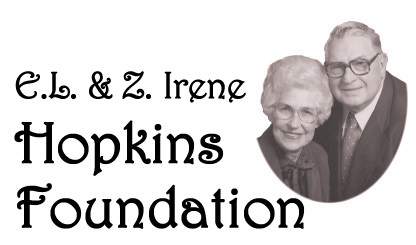 With these latest awards, the Hopkins Foundation has given approximately $377,000 to 191 teachers and support staff members in the Emporia schools since the inception of the awards in 2002. The awards program was a dream of Molinaro’s grandfather, E.L. Hopkins, as a way to reward educators. Hopkins Award nominations can be submitted anytime during the year by parents, student and staff. An online nomination form is posted on the homepage of the district website, www.usd253.org. A selection committee meets at least quarterly to review nominations and select winners.